by Courtney Ravelo The third of four installments in The Divergent Series, Allegiant, comes as a breath of fresh air for fans of the franchise. Following the popular trend among YA novel adaptations of splitting the last book of the series into two movies, this film is impressive in some ways but disappointing in others. It works well as a movie on its own, but it’s problematic when thought of in the context of the book it’s based on. The result is something that leaves me excited for the final installment while also slightly bitter about some of the adaptation choices. In the previous Divergent films, the protagonist Tris (Shailene Woodley) finds out that she’s “Divergent,” which means her brain does not work like the rest of her dystopian society in Chicago. She’s different, therefore she is presumed dangerous. The first two films revolve around Jeanine (Kate Winslet), one of the leaders of this society, who seeks to kill all Divergents in order to maintain their faction-based society, in which every person fits into a role. Tris and her friends take down Jeanine, and find out that the wall protecting them from the outside world was really just protecting the outside world from them. In Allegiant, Tris and her friends fight their way past a new leader named Evelyn (Naomi Watts) and out of Chicago, beyond the wall that has kept them captive their whole lives. They know something is out there, and even though they aren’t allowed to leave, they decide to take the risk. Once they escape Chicago, what they find is not what they’re expecting: The outside world is just as corrupt as their broken society within the confines of Chicago. One of the two reasons I can’t give this film full marks is simple: the CGI and special effects/graphics are terrible. I could see where the green screen ended and where the real objects began. That visual obstruction took me out of the story, leaving me frequently distracted by the hard lines between the actual landscape and the computerized graphics. I do, however, like the way the filmmakers decide to go about creating the apocalyptic world outside of Chicago; from what I remember of reading the book, they do a good job of portraying what the author (Veronica Roth) described. The landscape is beautiful in its red hue, but it is also tragic, as it’s obvious that bombs and nuclear explosions have warped the landscape. The other reason I can’t give this film full marks only affects those fans who watch the films because they’ve read the books: this film is more removed from the original text than the previous two films were. The first installment, Divergent, was almost exactly like the book minus a few extraneous details — a very faithful adaptation indeed. The follow-up, Insurgent, was a little more distant, but it developed the plot nicely and reasonably fit the content that it could into a cinematic version of the novel. However, Allegiant is so distant from the book that I was uncomfortable not knowing what was going to happen next when watching it. There’s a certain level of comfort that readers share when watching their beloved stories turned into film, and when that comfort is taken away by an almost entirely new story with the same title, true fans may be disappointed — which, in this case, I was. One of the biggest parts of the book concerns Peter (Miles Teller), one of the members of Tris’s group. Peter constantly antagonizes the characters, only doing what’s best for him and not considering the harm it might do to others. In the novel, when the main antagonist David (Jeff Daniels) introduces memory serum to wipe out the memories of the Chicago people he is fighting against, Peter steals it and injects it into himself so he can forget his horrible actions and start over. However, in the movie, Peter actually works for David, and David ends up screwing Peter over by leaving him in exile. This plot difference fundamentally changes Peter’s character and it’s just one example of where I feel the writers went wrong in adapting the novel to the screen. The pros of the movie outweigh the cons, though. For instance, the close-ups of Woodley’s face throughout the movie give the audience a sense of closeness to what’s going on. There’s also an intense bond between Tris and Four (the central love interest, played by Theo James), with Woodley and James showing beautiful chemistry. The couple has a special relationship, and some of the most important scenes in the previous films just consist of their facial interactions. The Divergent Series is about persevering when authority steers you wrong and about breaking down barriers between different types of people instead of categorizing people. The romance between these two protagonists is such a positive light in such a dark situation, and through this, the audience is given a reprieve from the tragedies that take place throughout the series. The film itself is action packed, full of explosions and fight scenes. There’s a lot of anticipation in these sequences. One particularly memorable scene finds Tris and her friends climbing up the wall outside Chicago when they realize that there are electric wires at the top that need to be turned off so they are able to get through them. 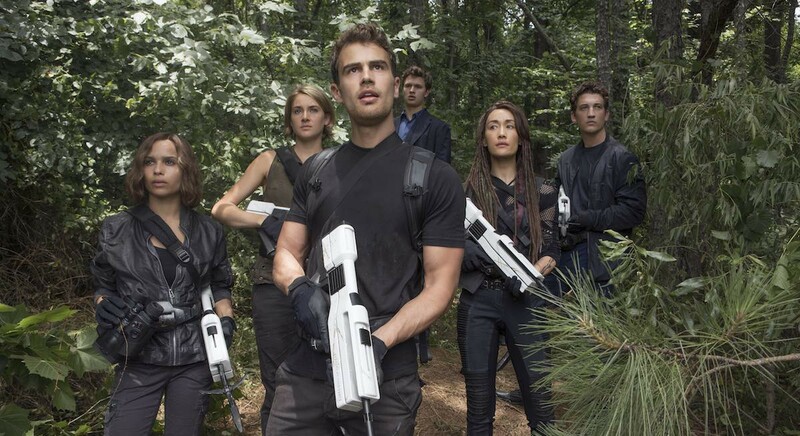 Tris and Four make their way back down the wall as Evelyn’s soldiers are closing in, firing their weapons. Tris attaches a small bomb to the electrical power switch and runs back to Four, jumping into his arms as they climb back up the wall. At this moment, the bomb goes off, simultaneously turning off the electric wires while destroying one of the trucks that pursue our protagonists. This scene is so well done; the music lends greater anxiety to the action while the pure connection between Tris and Four gives the audience hope that they’ll be successful. Since this scene was toward the beginning of the movie, it really established how the action scenes would play out throughout the film — that is, with a lot of careful detail and adrenaline. Director Robert Schwentke doesn’t leave any room for boredom or slowing down. In spite of its high energy and fast pace, Allegiant delivers on the emotional depth of its characters. Tris is given a choice of trusting David or Four, and ultimately ends up choosing David. She realizes her mistake soon after, and returns to her friends’ original plan, not showing an ounce of damaged pride, only an apologetic honesty and acceptance of her misstep. Allegiant answers some questions from the previous installment, but also leaves the ending open for the series conclusion, Ascendant, which is slated to release in summer of next year. With Tris and her friends having returned to Chicago by the end of the film, David is seen looking over Tris’s shoulder from afar, having recently been defeated, with war in his eyes. The feeling left in the audience when the credits start rolling is anything but optimistic, which is fitting considering the tragic nature of what is to come. 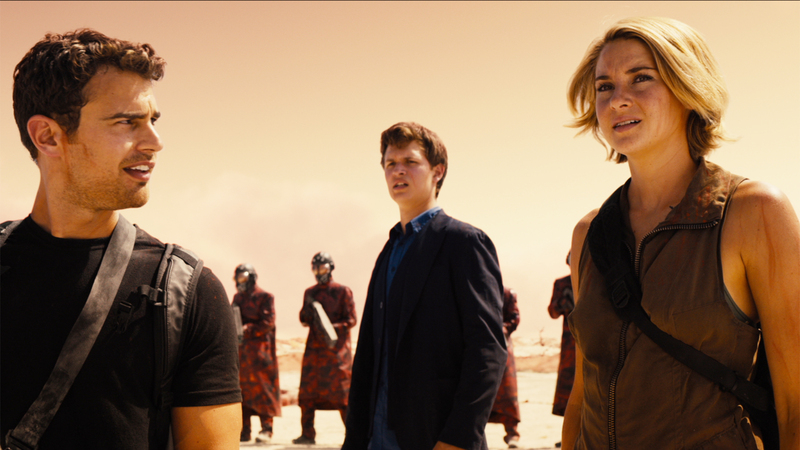 Allegiant is a must-see for Divergent fans. Although the series is now coming to an end, this installment kicks up the action a notch, while also furthering our understanding of the characters’ destroyed world with understatement — a fictional world that Roth has envisioned as not so far away from our own future. Tags: Courtney Ravelo. Bookmark the permalink.